Waterproofing a very wet basement prior to its conversion to living accommodation. The property sits on the bottom of a hill and is a flood area. This job was a big challenge firstly we could not stop the water coming into this basement we had to work with it. This was an extensive domestic project involving some small structural works in removing walls and the old concrete steps coming into this basement also the stone floor slabs. 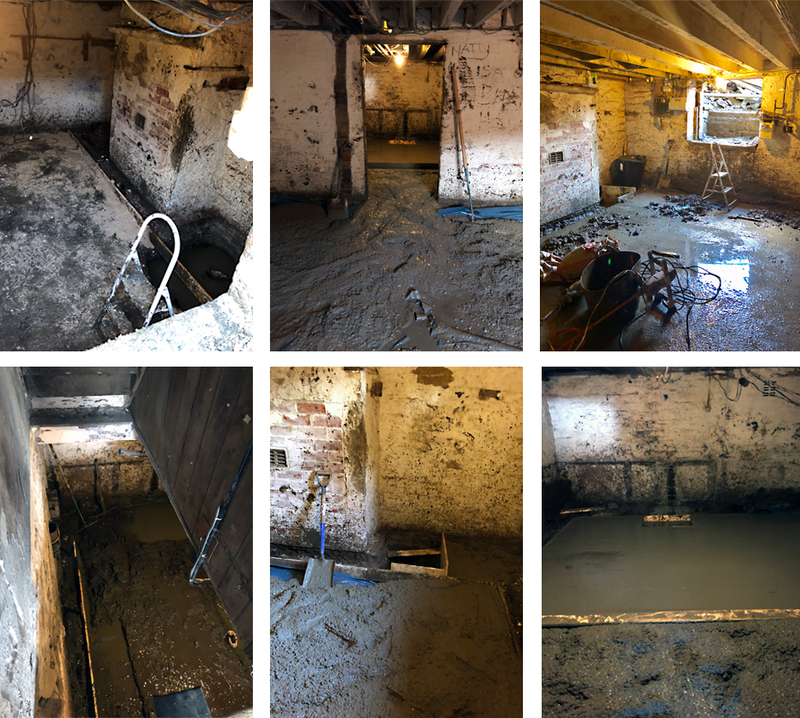 After excavations works filling 5 large skips and working in 5” of standing water we noticed large amounts of water coming into this basement from 2 side of the rooms. After further investigation I noted the pipework for the drains was letting water in and further more we uncovered an underground stream of water. To be able to slow the water coming in from the drains we replaced the drains and re-rooted them we was then left with the under- ground stream. We temporary rooted this water to a hole we had dug out and fixed a temporary pump to remove water so we could work. We then laid water-proof concrete to the whole basement at this point we could work on top of the base concrete so we were not walking in mud and water. Watertight Homes preferred method of waterproofing is to use a cavity drained membrane system as supplied by Triton. Cavity drained membranes work by allowing water to continue to penetrate the structure but control it in the air gap and divert it to a suitable drainage point via the Triton drainage system (pump/s, sump/s and drainage channel). The membranes can be loose laid on floors and are fixed to walls using special plugs and sealing materials. Once the membrane has been fitted, wall surfaces can be drylined or plastered directly and floors can be screeded or a floating timber floor installed. Defined as Type C waterproofing systems to BS 8102: 2009, cavity drain membranes are forgiving when movement or vibration can affect a structure’s resistance to water. They can be supplemented by a wide range of drainage/sump and pump components depending upon the factors affecting the individual project such as water table, depth of structure, anticipated water ingress etc. Watertight Homes used Triton’s Platon P8 membrane on the walls of the new basement and heavier duty, Platon P20, on the floors. Aqua channels was used and is a PVC drainage conduit designed to control water ingress in below ground situations. We fitted around the perimeter of the floor at the vulnerable wall/floor junction and is particularly suited for use in conjunction with Isola Platon cavity drain membranes. Water entering the building through the walls is controlled behind the Platon membrane, and diverted down to the aqua channel at the base of the wall. The water enters the aqua channel through pre-drilled drainage holes and then be diverted to our suitable drainage point, sump and mechanical pumps. My client did not want to take any risk with the amount of water coming into this basement so we used the Aqua Pump Pro Battery Back Up system comprises a polyethylene sump, locking access cover, powerful submersible x 2 pumps 24v back up pump and a 240 pump also control panel. It is designed for use where primary pump failure through mechanical fault of loss of mains power would be catastrophic. The system alerts the end user if the water rises above the normal operating level within the sump, and activates the back up pump via three separate float switches. The panel contains two trickle charged batteries. After now water-proofing the walls and floors I did a full inspection of the timber floor joist before we start to cover with fire protection plaster boards. I noted joist to be rotten on the ends and infestation of woodworm. So for the eradication of woodworm, Watertight Homes specified the use of Triton’s Tritec 121, applied by low pressure spray to the timbers and removing of the rotten joist ends. Tritec 121 provides a non-hazardous water based concentrate and dilution and a re-entry time to the area being treated of just one hour. It is also safe for use in bat inhabited areas. In this building the joist ends are let into sockets in the walls below the damp proof course. These joist ends was permanently wet and gradually succumb to slow decay from one of the Wet Rot fungi (usually Cellar fungus - Coniophora puteana). My team replaced the decayed joist ends, although only a small part of the joist is affected, can cause a major amount of work because the ‘small part affected’ is the vital joist end that is supporting the floors. The Bower Beam method eliminates most of the work of the traditional method and leaves the floor joist as strong as before and clear of the damp wall. It involved cutting the joist ends back to sound wood and applying preservative treatment then fixing Bower Beams to joist end and into existing wall socket. After all these works please see the finished photos we also have a video on our Facebook account. 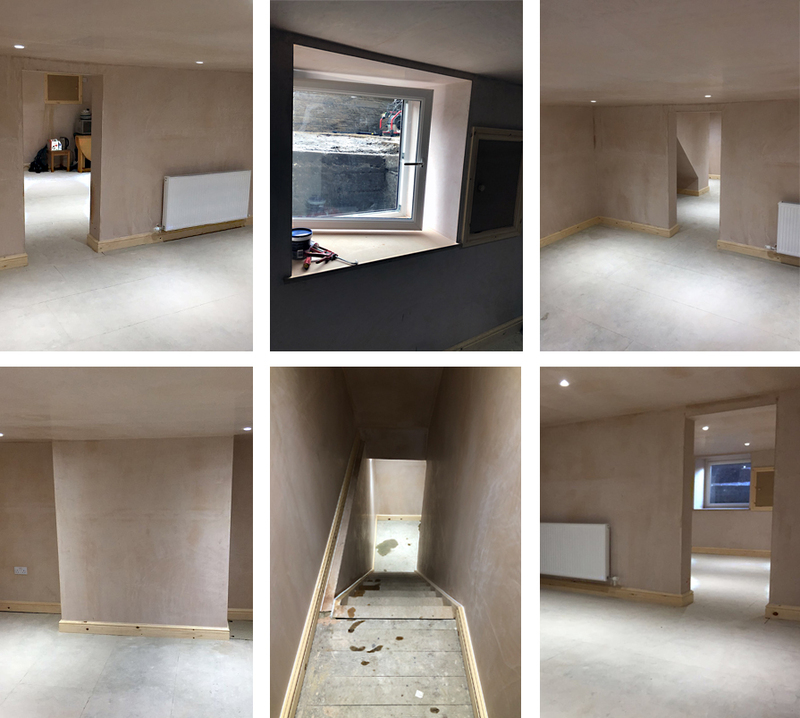 A video showing the amount of water that had to be managed by pumps during this recent basement conversion by Watertight Homes Yorkshire. This video gives you a 'Walk Around' view of the completed basement conversion.